For the first time in twenty-two years, Lama Ole Nydahl traveled back to the Buddha’s place of enlightenment in India. He joined the Kagyu Monlam 2012, the largest annual gathering of Buddhist masters and followers of the Karma Kagyu lineage, led by H.H. 17th Karmapa Trinley Thaye Dorje. The Kagyu Monlam is held in Bodhgaya next to the Mahabodhi Temple, where all Buddhist schools meet and reconnect to the Buddha’s auspicious achievement of full enlightenment over 2500 years ago. 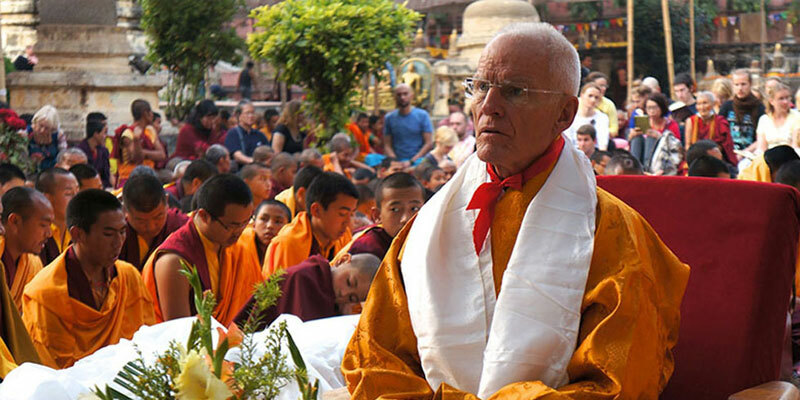 Lama Ole Nydahl joined the Karma Kagyu gathering directly following his journey to Bhutan. It was a joy to meet again with His Holiness and the Rinpoches of our lineage: Shamar Rinpoche, Jamgon Kongtrul Rinpoche, Beru Khyentse Rinpoche, Jigme Rinpoche, Sherab Gyaltsen Rinpoche, Nedo Rinpoche, Shangpa Rinpoche, Lama Teunsang, and many more. All pillars of our Karma Kagyu lineage and their students from both the East and West were present. To Lama Ole’s joyful surprise, H.H. 17th Karmapa Trinley Thaye Dorje honored Lama Ole’s 40 years of activity with a remarkable gift at the event: a traditional Tibetan robe made in golden brocade. Joining Kagyu Monlam 2012 was another example of Lama Ole’s growing work in the East. In recent years, he has given Buddhist lectures and courses in Hong-Kong, India, Nepal, Bhutan, Japan and Thailand.